How old is that poster though? Perhaps it was produced at the beginning of the campaign when many pollsters still had the Liberals 2nd. In Davenport it has been dishonest since the start. The Conservatives got 7% in the last election and the Liberals beat the NDP by 5 points at 45%. The NDP won in 2011. The Liberals pulling this are counting on people being ignorant of the facts. Yes they are not as right wing but the Liberals are every bit as crooked as the Conservatives. This type of stunt does tempt you to be happy when they get destroyed in an election. SJ, there was never any possibility that the OLP could possibly have been re-elected this year. No scenario would have brought them from behind to beat the PC's. No governing party as unpopular as the OLP was coming into this election has ever been re-elected in Canada. So kindly give the "the OLP could have beaten Ford but the ONDP can't" thing a rest. 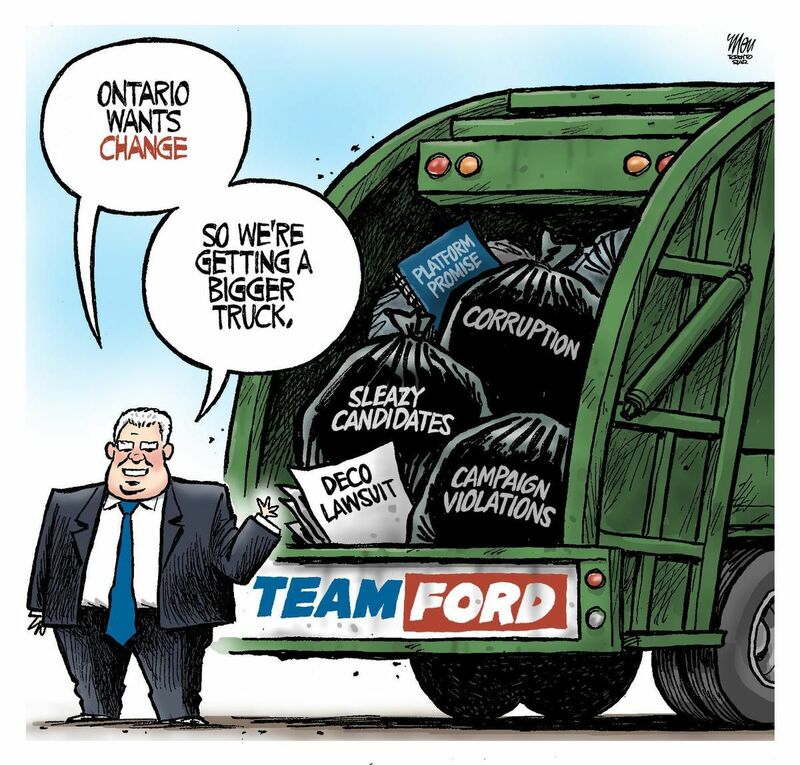 If Ford gets in, its solely Wynne's fault. And the polls show that an ONDP victory is a real possibility, and a far likelier possibility than an OLP comeback could ever have been this year. And if you believe his sister-in-law, Doug Ford mismanaged the family business and lost millions. But as Premier, he'd have people for that stuff. How many times did Trump go bankrupt? Yeah, and if it weren’t for the fact that the U.S. government can print money, he would drive it into bankruptcy. "Ontario is imposing automated counting precisely at a time when others are waking up to the hazards. We have no guarantee the June 7 official election results will reflect the choices made by voters..."
With just days before Ontario’s provincial election campaign, the New Democratic Party (NDP) has surged from third to first place, raising the serious possibility that Canada’s social democratic party could win control over the country’s largest province. Though an impressive feat, the social democratic party’s gains are not completely of their own making. Both partisans and election analysts estimated there was a path to NDP victory given voter exhaustion with fifteen years of Liberal rule and a desire to stop Doug Ford’s right-wing Progressive Conservatives (PCs). While some of the NDP’s support is soft, the NDP has not shied away from promoting a platform that features a major expansion of the public health-care system that will finally offer pharmacare and dental care. The party is also promising to go further than the Liberals recently have on progressive labor law reform and child care. And the NDP is promising to pay for all of its new spending by raising taxes on the wealthy and corporations. Let's see if that Liberal vote can be droped to the 10-15% range, eh! So now local Liberal campaigns have come to the place where they just make up polling numbers and put them on a leaflet. And if it confuses people and helps elect Ford, who cares. Unethical. Where did they get these phone numbers - from the 407 identity theft? Horwath & Ford making last minute campaign stops today. Maybe it is closer than we think, eh! Wynne’s campaign would have from no Wynne. The one challenge that remains for the NDP in Ontario is the 905. Historically, it has been difficult for the NDP to win the 905, both provincially and federally. This is probably what will give Ford & the PC's the edge over Horwath & the NDP tomorrow night. In his book, "Building the Orange Wave", Brad Lavigne said that winning the 905 would be critical for the NDP's success in winning Ontario (and winning Nationally). Not everything can be blamed on the Ontario Liberals. Wynne has admitted she can't win the election. Part of the reason Ford may beat Horwath has to do with the fact that the NDP has trouble appealing to Conservative voters. And as several editorials today point out (eg. the one in The Globe & Mail), many Ontarians aren't happy with any of the options. 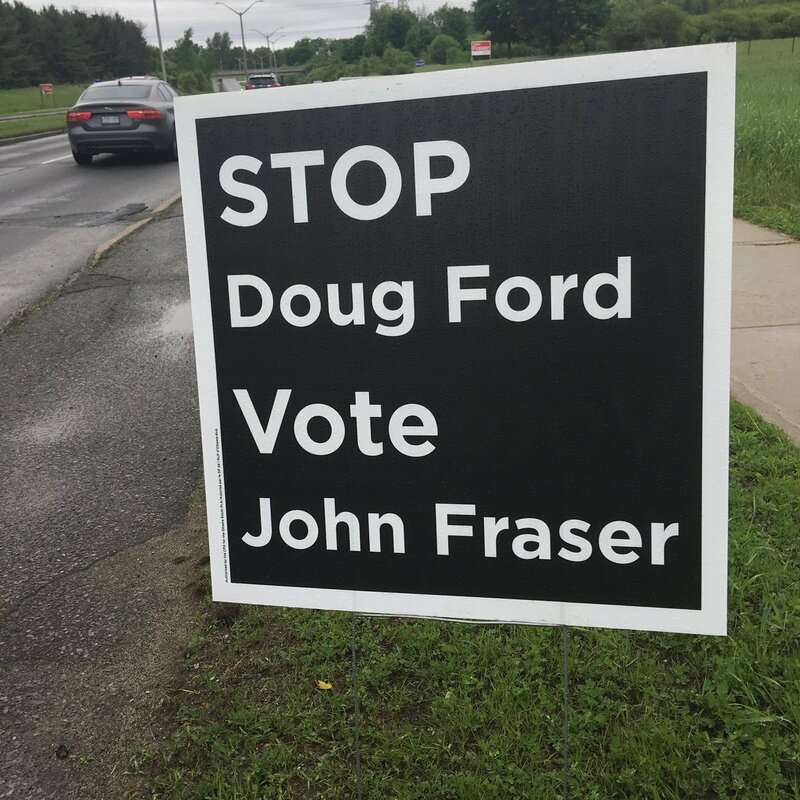 They are tired of Wynne, suspicious of Ford, and not inspired by Horwath. Horwath has run an okay campaign without making any major mistakes, but she hasn't ignited enough passion in the voters the way Jack Layton or Justin Trudeau did. It was better for the NDP not to excite passion. The reason Horwath is doing so well is because she seems like a "normal" person. Leaders with passion are more likely to grab the attention of voters. Look at Trump vs Hillary. One of them had passion, while the other one did not. And we all know how that turned out. It depends on who else is on the playing field. In this case Horwath needed to pick up Liberal voters and maybe some Conservatives too. Had she been fighting both the Liberals and the Conservatives then she would have to go more left. Her goal now is to replace the Liberals. She should have been more agressive attacking Ford, his social policies, his record in Toronto, and his supposed business acumen. You don't bring a knife to a gun fight. Ford smeared the NDP so bad during the last debate, and Horwath just did not hit back hard enough. It may be one of the reasons the NDP lost the momentum, if you believe the online and IVR polls. These numbers show there is a huge overlap between NDP and Liberal voters. Another poll showed that if the entire electorate had to choose only between the ONDP and OPC, the ONDP would win by 60% to 40%. It’s a killer quote. The NDP and Liberals made nothing of it. These numbers show there is a huge overlap between NDP and Liberal voters. And that's one of the challenges that the Liberals & the NDP both have, and it's also why they are such bitter rivals. And it's why the Conservatives often benefit. Has the NDP polling gone up since Wynne "conceded"? Not really. Haven't budged much all the way around. It is the role of the Liberals to usher in a Conservative government, and then be the saviour after the wrecking ball does its work on behalf of the 1%. Then, nothing changes for the good during the Liberal government, ushering in another Conservative government. Phoenix is a good example. Trudeau could have cleaned up that mess by fiat overnight. almost 3 years later, civil servants remain unpaid. Unfortunately because of the Liberals not gonna happen. Then I guess the NDP was responsible for Harper winning minority governments in 2006 and 2008. If it was Trudeau's paycheque it would have been resolved overnite! The NDP for over a decade has been a conservative assist party, if they don't assist their electoral success and find themselves in government, they simply undertake their agenda. The evidence is abundant. Yet here the choir seems stuck on the Liberals did it note. Wonder why that is? There is credible research that voter turnout increases with age; the largest block of voters tend to be 65 and over and the smallest block tend to be young people between 18 and 25. But the past is not all that the future holds. The last Ontario election in 2014 saw a small increase in overall voter turnout. Notably, in the 2015 federal election voter turnout was at its highest since 1993: 57.1 per cent of young people aged 18 to 24 and 57.4 per cent of those aged 25 to 34 showed up to vote, thus increasing turnout in their age groups by 18.3 points and 12.3 points respectively. In this provincial election, young people are the largest voting cohort, outnumbering baby boomers. Contrary to the BS here the Liberals are bailing pretty much everywhere. FDR didn't do too badly. And Canada has certainly benefitted from Medicare. The difficulties today are more complex and diverse. But people like Corbyn and Sanders are pointing the way. It will be up to those younger to move the boulder back to the top.